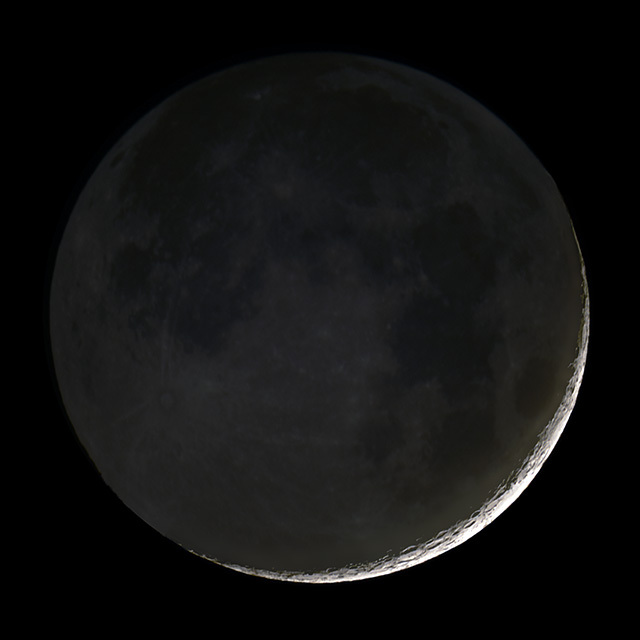 It's a beautiful clear night in Austin, Texas, with a 2 day old waxing crescent Moon at 2018-10-11 01:00 UT. Questar 89 mm f/15 telescope with a Sony a6300 camera at prime focus. Crescent exposed 1/10 sec at ISO 400, earthshine exposed 10 sec at ISO 400. Crescent best 8 of 81 images stacked in Autostakkert 3. Eathshine 15 images stacked in Lynkeos. Images deconvolved in Lynkeos, the composited, cropped, and exposure adjustments in Photoshop.